The RFQ linac structure represents the best transformation between the unbunched beams that come from ion sources and the bunched and accelerated beams that are required by the RFI and all other rf linac structures. There are two distinct types of RFQ linacs, namely the “Four-Vane RFQ” which is generally preferred for rf frequencies of 350 MHz and above, and the “Four-Bar RFQ” which is generally preferred for rf frequencies of 200 MHz and below. Because of the 200-MHz rf frequency chosen for the RFI linac structure, the RFQ linac structure will be of the four-bar type. The RFQ linac will capture and bunch the proton beam from the ion source and accelerate it to 0.75 MeV, which is a suitable energy for acceptance by the RFI linac, and lies well within the RFQ’s efficient range of operation. 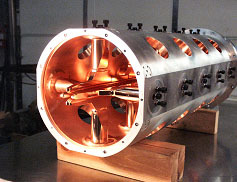 The Four-Bar RFQ linac has four bars running the length of the linac, displaced a few millimeters above, below, left, and right of the beam axis. The electric field between the bars has a quadrupole configuration which focuses the particle beam in one transverse plane while defocusing it in the other transverse plane. The focusing and defocusing action alternates with the rf frequency resulting in a net focusing of the beam in both transverse planes. The bars also have a scalloped profile, which introduces a longitudinal component to the quadrupole electric fields, which in turn provides the accelerating action for the structure. We have two designs for our RFQ structures: 1) a Radial Strut design where the individual bars are supported by radial struts emanating from the wall of the cavity in a four-pole symmetry, as shown in Fig. 1, and 2) a Box-like design, comprised of identical top and bottom pieces and identical side pieces, as shown in Fig. 2. The main structural element of the Radial Strut design is the heavy wall aluminum tube (the cavity). The main structural elements of the Box design are the rigid box walls. In the Radial Strut design, the main cavity, bars and struts are made of aluminum and are copper plated to increase their electrical conductivity. The cavity, bars, and struts are cooled by a number of separate cooling channels. Temperature-controlled water is pumped through these channels to cool and control the temperature of the structure. A counterflow arrangement is employed so that the average temperature at all locations along the structure will be the same. 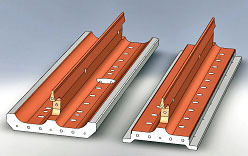 In the Box-like design, the four pieces are very rigid and suitable for assembly without additional alignment. The four pieces are made of aluminum and copper plated for conductivity. Small changes in the resonant frequency can be realized by shimming the 4 assembly joints. Holes are drilled through the length of the four pieces for cooling purposes. This design employs dipole mode suppressors to control the frequency of the dipole mode. The rf efficiency of this design is superior to that of the Radial Strut design. 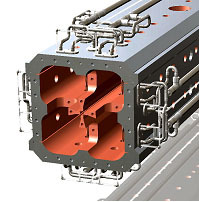 The RFQ linac structures are mounted inside vacuum tanks that provide the high-vacuum conditions required by the beam, the rf power, and the linac structure. The RFQ vacuum tanks are pumped by single 400-l/s turbomolecular vacuum pumps and typically operate at a vacuum pressure in the range of 5x10-7 Torr. The beam dynamics codes RFQSCOPE and PARMTEQ were used to converge on a detailed design for the RFQ linac section. Figure 1. Radial Strut RFQ Linac Structure. Figure 2. Box-like RFQ Linac Structure.